“Who are the real terrorists in the world? 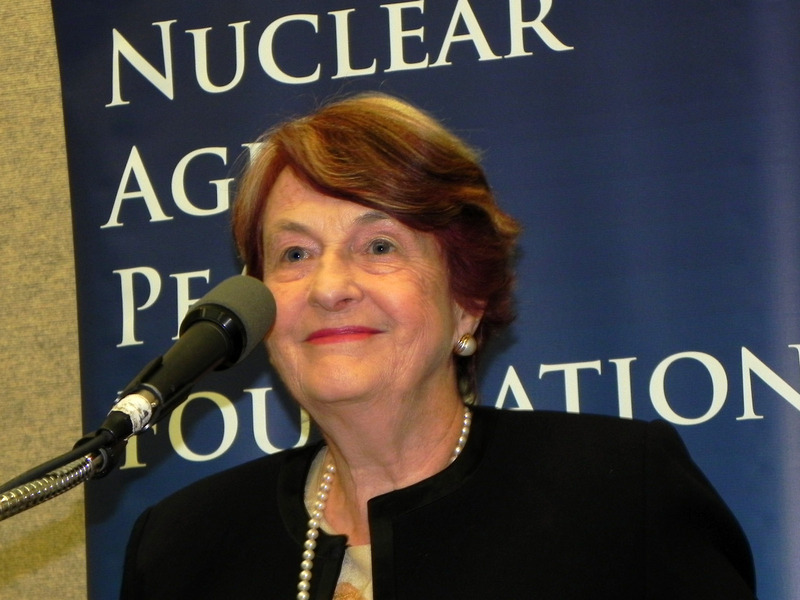 Russia and America,” said Helen Caldicott, Australian medical doctor and the leading activist against nuclear weapons. She talked of the terror of missiles armed with nearly 15,000 nuclear bombs in the two countries on hair-trigger alert and ready to fire on each other; war set off by a deranged leader, human blunder, computer error or hacking, or an international crisis; infernos from coast to coast; people vaporized into black, radioactive clouds; an ice age that ends nearly all life on earth. The world has come so close to nuclear war so many times, “I don’t know how we’re still here,” she said in a San Francisco lecture before a packed Koret Auditorium in the main San Francisco Public Library. During that talk, on August 13, and in a broadcast on KGO-radio one week earlier, Dr. Caldicott pleaded for the abolition of nuclear weapons, as she had been doing for 45 years. She wants the people of the U.S. and Russia to insist that their leaders reach a bilateral agreement to get rid of all their nuclear bombs — most of the world’s supply. Only then will other nuclear nations do so, she says. 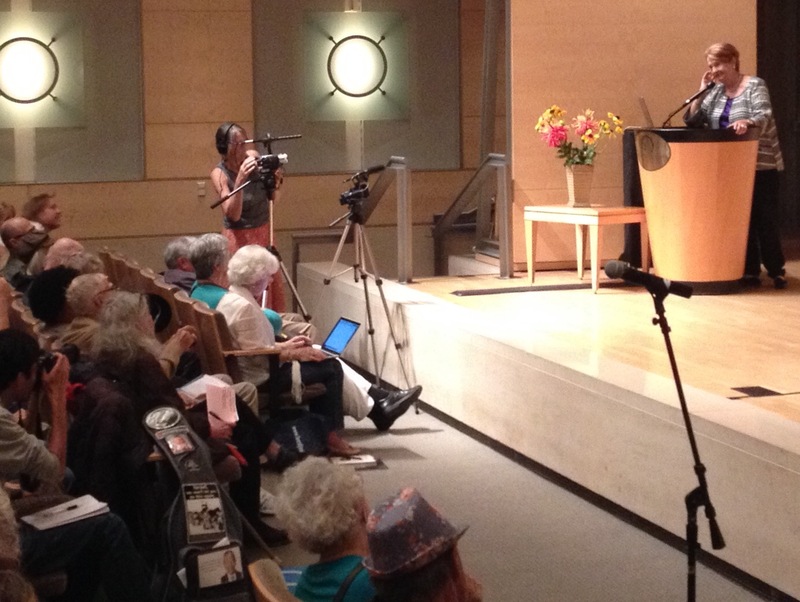 The meeting was cosponsored by the San Francisco Public Library and the budding Coalition for Nuclear Disarmament, made up of 15 pro-peace groups. Its objective: getting Article VI of the Nuclear Non-Proliferation Treaty back on track. The article mandated early negotiation for a treaty to eliminate nuclear weapons. American Friends Service Committee; Berkeley Fellowship of Unitarian Universalists; Code Pink; Dominican Sisters of Mission San Jose; East Bay Peace Action; Ecumenical Peace Institute/CALC; Mt. Diablo Peace and Justice; Physicians for Social Responsibility, SF Bay Area Chapter; Shomer Shalom Network for Jewish Nonviolence; Tri-Valley Communities Against a Radioactive Environment; Veterans for Peace, Chapter 69; Western States Legal Foundation; Women’s International League for Peace and Freedom, SF and East Bay Chapters; and World Beyond War. Caldicott cited these examples of events or errors that brought the world close to nuclear war: A solar storm affected magnetic fields and led a satellite to indicate that Russia had launched atomic bombs on the U.S. An American weather satellite over Norway had the Russians thinking that the U.S. had launched such bombs on them. Someone plugged a war-games tape into a Pentagon computer, giving the illusion of a Russian attack. Then there was the Cuban missile crisis. Your generosity, which makes this event possible, is deeply appreciated. Statistics and images: We will get at most five minutes’ notice. Each bomb arrives at 20 times the speed of sound, so you won’t hear it. It will explode with 10 or 20 times the heat inside the center of the Sun. It will dig a hole three-fourths of a mile wide and 800 feet deep, and all of us in the buildings and the earth below are ejected into the mushroom cloud into the stratosphere, out to about five miles. In Hiroshima, a woman had been running with a baby. She was converted into a charcoal statue. People were walking with skin falling off their bodies, eyes melted; they looked at the bombs. Winds of 500 miles an hour sucked people out of buildings. Pieces of glass traveling at 100 miles an hour decapitated people. The Russian bombs are big, many times bigger than those dropped on Hiroshima and Nagasaki. Every town in the U.S. of 50,000 population or more is targeted. The whole San Francisco Bay Area would burn, and so would the entire country, coast to coast, north to south. Seventy-one years after President Harry Truman made that announcement — ignoring the hundreds of thousands of children, women, and civilian men whose lives his bomb destroyed — Dr. Helen Caldicott appeared on KGO-radio in San Francisco to plead for nuclear peace. John Rothmann’s first question in a half-hour interview was what it was like to meet with President Reagan. Dr. Caldicott had met the President’s pro-peace daughter, Patti Davis, who said, “I think you might be the person who can change my father’s mind” (as quoted by Rothmann). Patti sat quietly as Reagan and Caldicott talked for an hour and a quarter (said Caldicott ). Caldicott quoted Reagan as saying, early in their meeting, “I too am scared of nuclear war, but … I believe in building more bombs.” Caldicott had just written the book Missile Envy and was full of facts and figures. “Almost every single thing he said to me was wrong or inaccurate, so I would interrupt him and correct him…. I held his hand about half the time to reassure him…. I came out saying he had impending Alzheimer’s, and that was the correct diagnosis. The legality of giving a president the equipment to violate the Constitution — which assigns the authority to initiate war solely to Congress — did not come up. The U.S. and Russia have 93 percent of the world’s 16,000 or more nuclear weapons, she added, and only those two countries can destroy all creation. Rothmann asked what to do about “rogue nations” and terrorists? She said, “North Korea could blow up a city. I’m talking about the end of life on earth. “ … A thousand bombs dropping on a hundred cities would create such a huge firestorm and America would burn from coast to coast, north to south. 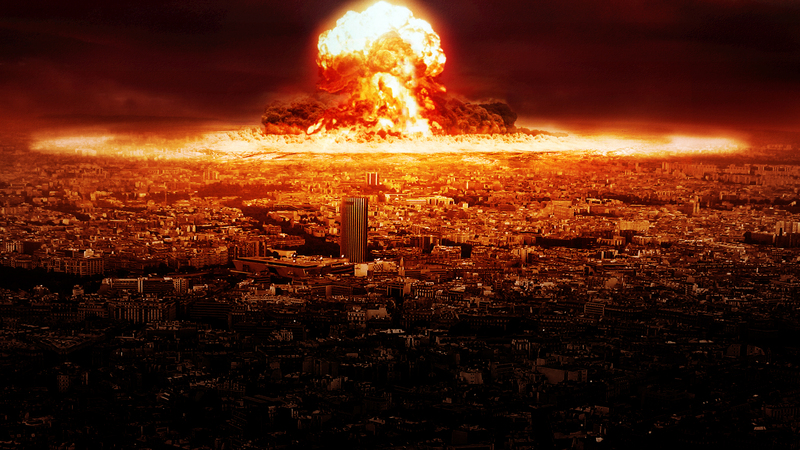 The radioactive smoke would rise into the stratosphere, blocking out the sun for up to ten years, inducing a short ice age where everything and everyone would freeze to death in the dark…. In the 80s, “we mobilized 80 percent [of the American people] to oppose nuclear weapons and nuclear war.” She blamed the current mass media for ignoring what should be the number-one issue. Men like William J. Perry, former secretary of defense, and General James Cartwright and others say “we’re closer to nuclear war than we were at the height of the cold war,” Caldicott said.